The BEST Fried Green Tomatoes with Garlic, Bacon and Buttermilk Sauce from La Bella Vita Cucina for fresh summer tomatoe recipes! Buon Appetito! Yes, this is THE. BEST. 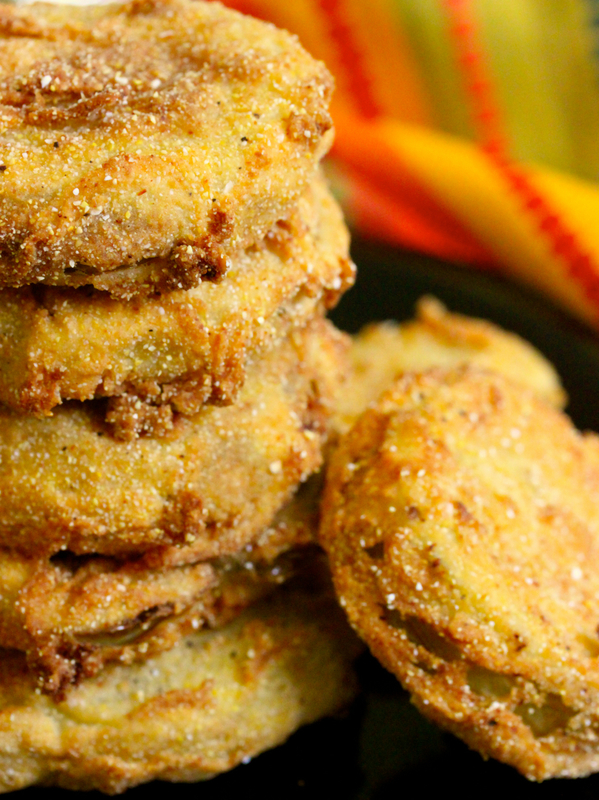 Fried Green Tomato recipe. EVER! With a superb buttermilk sauce to slop all over the fried tomatoes, filled with fresh-cut herbs from my garden PLUS more garlic and chunks of thick-cut bacon . . . totally heavenly . . . not quite totally Southern with the addition of the garlic . . . but TOTALLY AWESOME! The character of this recipe also comes from some hot sauce added to the garlic-y buttermilk and Italian breadcrumbs to the crust! Hot, crispy, and tangy fried green tomatoes encrusted in a perfect fried batter are the perfect treat throughout summer! If you’re watching your weight as I am (constantly) doing, you’re probably thinking that I’m such a tease! But it’s OK to indulge now and then, and that’s just what I chose to do today! Besides, if you just eat a few bites, my philosophy is that it’s perfectly fine to enjoy everything . . . in little bites! For those of us who have green tomatoes in our gardens (we actually have both green and red tomatoes on our vines right now), it’s time to prepare this traditional Southern recipe. Don’t have a garden? No problem . . . head to your local farmers’ market! If possible, use a heavy cast-iron pan. 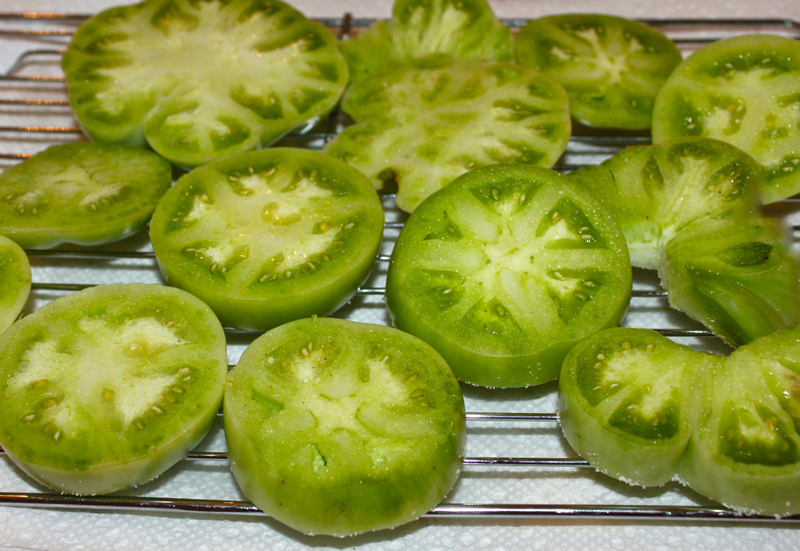 Also remember to select firm green tomatoes, and fry in very hot oil at 360° (F). 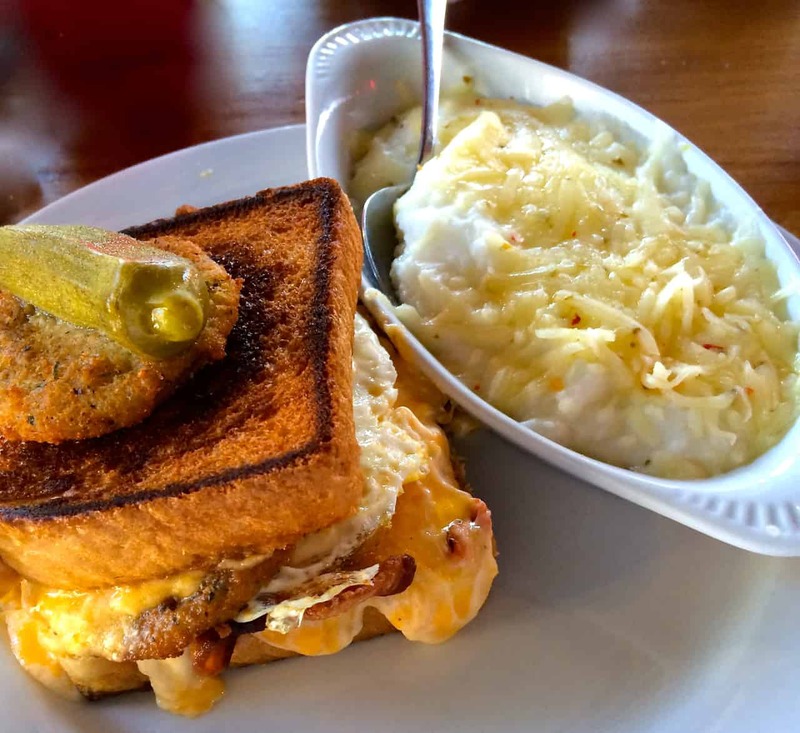 So go grab an ice cold glass of sweet tea and just sit on a couple of rocking chairs on the front porch while enjoying the company of those you love and nibble on this classic Southern treat — The BEST Fried Green Tomatoes with Garlic, Bacon and Buttermilk Sauce! 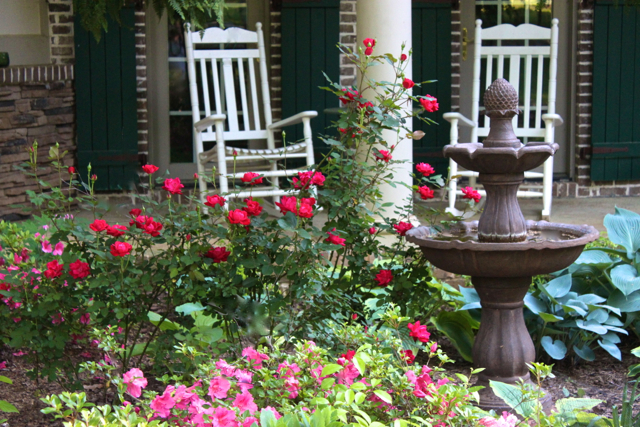 our front porch in South Carolina where we go to simply smell the roses, to sip on some ice cold sweet tea and nibble on good eats! perfect green tomatoes, fresh from the garden! notice the liquid sweating from the salted tomatoes in the photos! Cook the breaded tomatoes in hot oil in a heavy cast iron skillet . . . cook until a beautiful golden color results! the superb garlic buttermilk sauce that makes all of the difference! Prepare this by adding all of the ingredients in a medium-size mixing bowl. Please share the love and pin this vertical image. We thank you! If you enjoy BOTH Fried Green Tomatoes AND Italian Cuisine, here’s a superb recipe that I created that I am sure you’ll enjoy! Another great recipe that you might want to look at for Fried Green Tomatoes is from Simply Recipes by Elyse Bauer. I’ve followed her basic recipes for over 10 years now and know her recipes are tried, true and trustworthy. CAn you believe I have never had a fried green tomato? Omg these look fabulous. I have always wanted to make them and had no idea how. My mom never liked them so we didn’t have them growing up. I really want the ones with the bacon and garlic! sounds so good! Going to pin these so I can save this recipe thanks so much! Claudia, if your family prepared ‘eggplant parmiganno’, this is basically the same thing and not as mushy. I don’t like eggplant and neither does my husband, so this really wins over our hearts! Super easy too! You have me pegged Roz since I could not possibly eat just one!!! I do love fried green tomatoes and in sandwiches too. These would be perfect with some sauce, in a BLT. I totally agree Val . . . in fact, you’ve just given me an idea for a great lunch sammie for tomorrow! More bacon added on top, of course! The coating, breading, and sauce all sound very good and I can imagine how delicious the combo is. 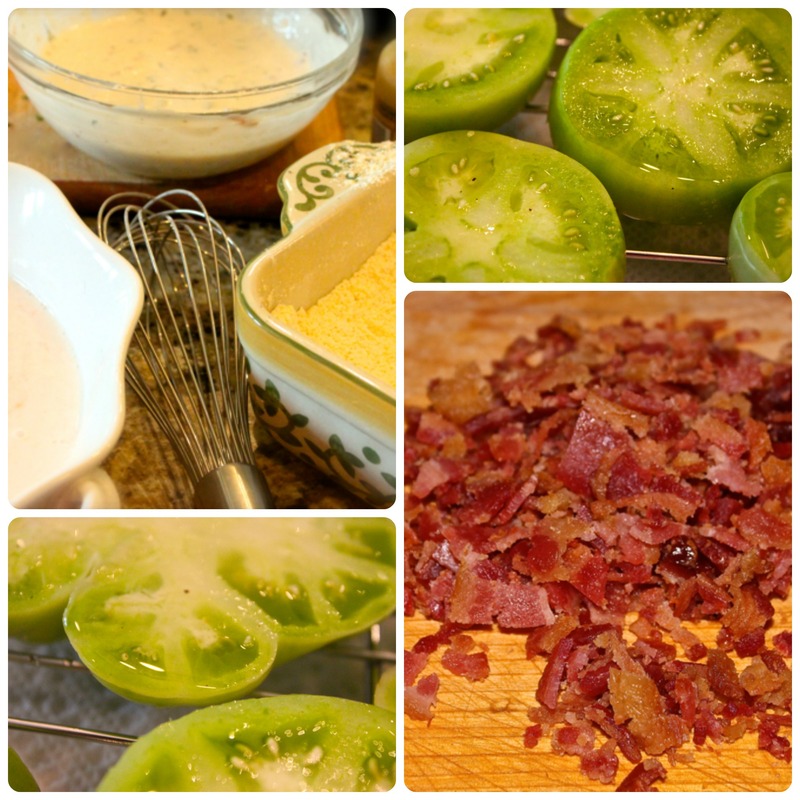 I love fried green tomatoes and am always looking for THE BEST recipe and this will be tried and enjoyed. I hope you try this Larry and come back to let me know what you think. Plus, as you always do, amp it up the way that you prefer and tell me what you did, and I’ll also try it! Love love fried green tomatoes! 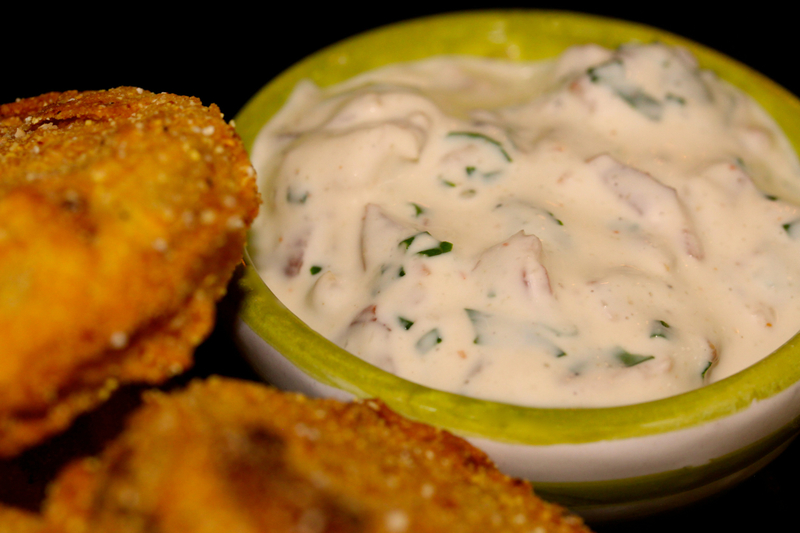 I love to dip them in Tzatziki sauce…have to try your buttermilk sauce next time. Thanks Angie! I enjoy fried green tomatoes with a variety of sauces too, sweet or savory! Even hot sauces. wow, i’ve never made or eaten FGT but these look so exceptional I must give them a go. Thanks for sharing the recipe, I can see how the garlic would be amazing here. Before living in the southern region of the U.S., I’d never had fried green tomatoes either. But they do live up to their fame! Hope you try this recipe, the sauce is outstanding! Thank you so much Betty! The sauce is truly a winner too! one of our favorite side dishes especially when we had a huge garden. My problem is keeping the coating on the tomatoes. Do you have a secret that you would be will to share? Barb, What I do to keep the coating on the tomatoes is first: salt those tomatoes and let them sit on a rack for a half hour. After that, tip the tomatoes on their side and allow the ‘sweated’ liquid to roll of. Then take a paper towel and pat each tomato slice dry. Then I dip into the buttermilk mixture and into the dry mixture, making sure that I completely cover each slice and PRESS down on each. Then I gently shake the coated slices and repeat the wet to dry, cover and press step again. I immediately put them in the hot oil. Hope that helps Barb! thanks for your visit, I greatly appreciate it. If you make these, I hope that you stop back by and let me know how they turned out for you! This past year, and for the first time ever, I fried me some green tomatoes. I was so surprised at how delicious they were. I must try this recipe with the buttermilk sauce. Thanks for sharing. You’re so welcome Lea Ann. 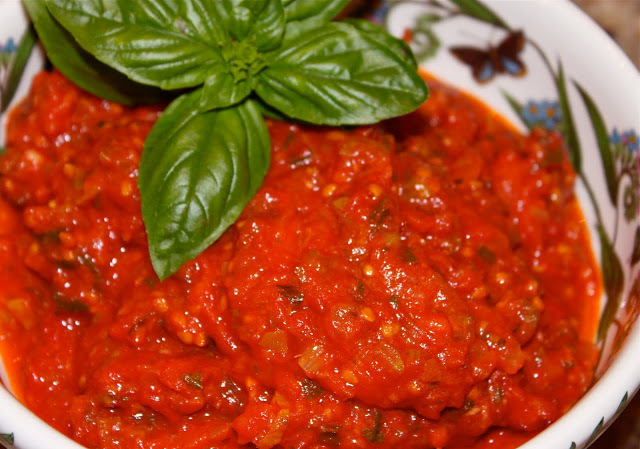 I guarantee that you’ll love this sauce, my husband just about drank it! Oooh, another one to add to my I-make list! You’re so sweet Mindy! Let me know what you think if you prepare this. They’re addicting! Thank you kindly, Rebecca! The garden helps us focus on healthier food and eating! 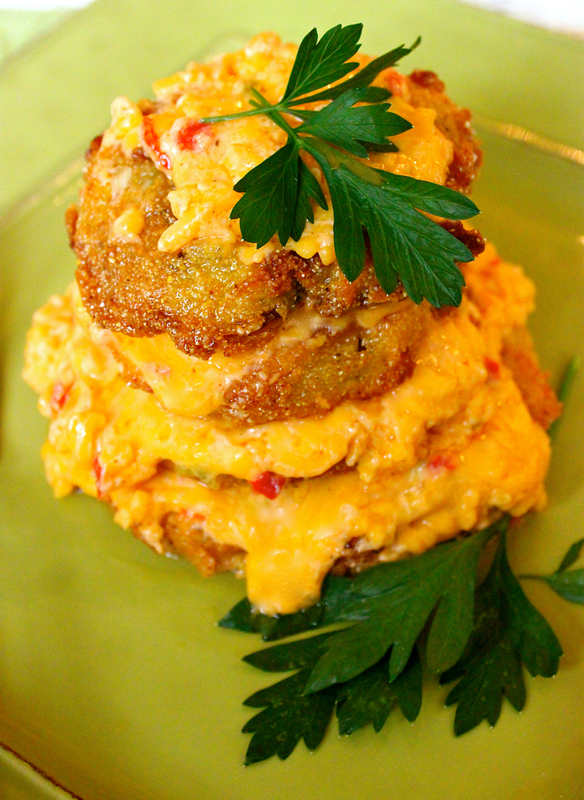 Roz, I have never eaten fried green tomatoes either, but your pictures make me want to try them! I am going to save your recipe for next year to use when we have our garden as it is no longer producing. Thank you for the detailed directions. Your buttermilk sauce sounds wonderful, too. I always struggle with my weight so appreciated your philosophy of little bites of everything. Thanks so much for sharing your recipe and gorgeous photos! 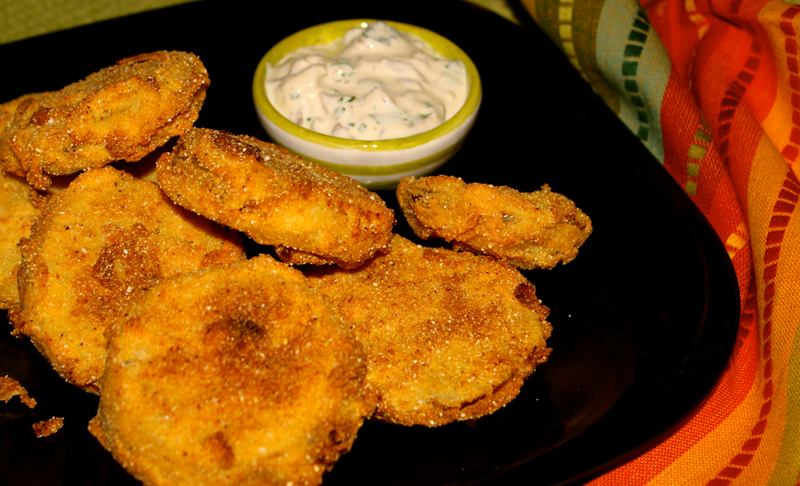 Shari, Fried green tomatoes are tangy, so they are like fried pickles and not as mild as fried okra. It’s a great way for gardeners to use early tomatoes and those that never ripen completely at the end of summer. But in Arizona, I doubt that would ever by a problem — running out of warm summer … except I do remember that winter got pretty chilly! Shari, I hope that you try them someday; they are truly a Southern recipe that I, too, had never tried until I moved here. YUMMY stuff though! In the meantime, try the sauce to dip carrots, celery and other veggies in . . . you’ll love it! Garlic? Who’d have thought? I know what to do now with those green tomatoes in my garden. I just wish I had a porch like yours to while away the time. Garlic is a God-send! I wish I could have you HERE to chat with on my front porch! And in Italian would even be better, Linda! 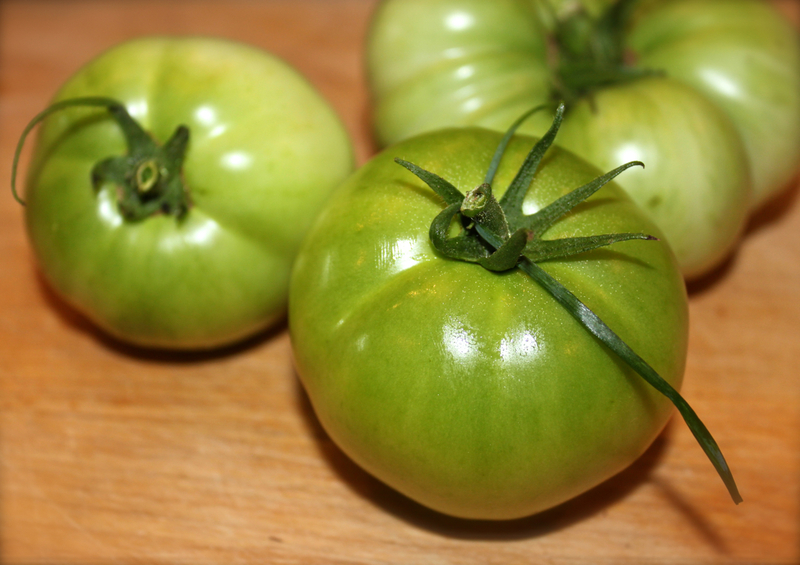 My husband asked me yesterday if I was going to make fried green tomatoes this year – and this recipe sounds great! Love the buttermilk sauce – it all looks wonderful! Hi Tricia! Husbands usually know what they want and if likes F.G.T.’s, he’ll LOVE these. The sauce is the star too! Thanks for your visit Tricia! OMG I have to make these! They would be fantastic as an appetizer too! Oh I love the buttermilk dip with bacon and garlic- how can anyone resist? You are the best Roz!! I know that you two have got to have a delicious fried green tomato recipe, but if you try mine please let me know what you think! 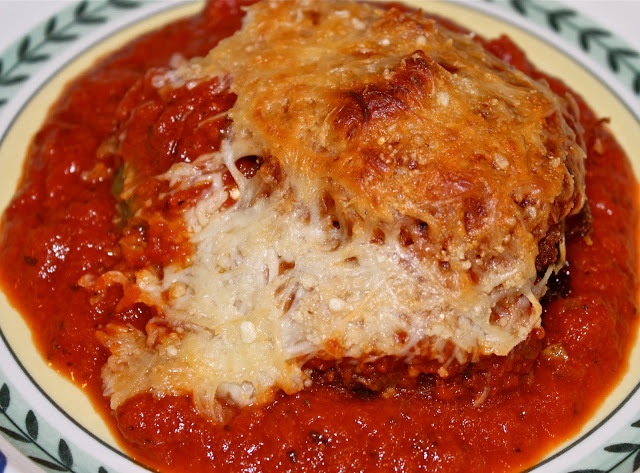 I’ll bet this would be delicious using Zucchini too… Mmmmm – gotta try it! Thanks for the recipes! You’re so very welcome. 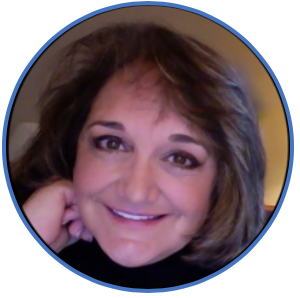 It’s my pleasure, and I am thrilled to have you here reading my blog and recipes! WELCOME, WELCOME, WELCOME! I made these tonight and they were amazing!!! Oh my goodness, the sauce just takes them completely over the top. Thank you for sharing!!!! I’m SO GLAD that you enjoyed them! I’m thrilled that you had a great experience!